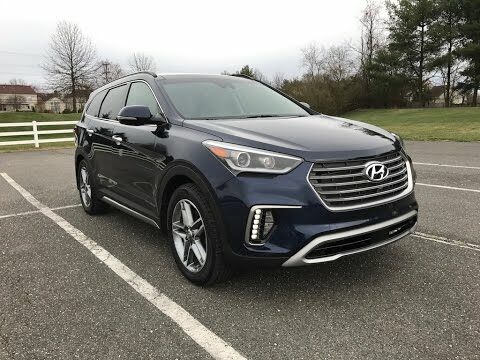 Sharing much of its styling and chassis with the smaller Santa Fe Sport, Hyundai's 2017 Santa Fe appeals to larger families by offering a potent V6 engine and a 3rd-row seat. With impressive standard features and even more impressive options, the 2017 Santa Fe crossover SUV feels like a premium-luxury model with a family-friendly price. All the wonderful things about the Hyundai Santa Fe! The seats are comfy and easily adjustable. The cloth seats are very sturdy and stylish. There is a lot of storage space in the middle console and glove box. The trunk also has a lot of space for my two large dogs to fit comfortably. The back seat is roomy for passengers and also have air vents which was important to me. The outside is sleek and modern looking which I love! This car has a lot of power for getting on the freeway and passing other cars when necessary. It drives so smoothly which can be dangerous because you do not realize how fast you are going sometimes. Although the driver's display can show the speed you are going nice and large for you to see. The only thing I would change about this car is the gas pedal. You push in on the top of the pedal to accelerate and I am used to pressing the bottom of the pedal in. So that takes some adjusting but is not a big deal at all! I have driven about 15000 miles so far and have had few issues that have needed action. Both of the items we are currently working on are related to the new technology that we're all supposed to be so excited about yet to date even the manufacturer hasn't been able to figure it out. Thankfully again they don't affect the operation of the vehicle. The things I like about the vehicle are the safety features such as blind spot warning and backup camera. The seats are the most comfortable I have ever had and the addition of the rear passenger sunscreens built into the windows as well as the availability of Android Auto make driving much more enjoyable. The 2017 Hyundai Santa Fe Sport is simply the best value for the money in its class. This is the perfect vehicle for any Mom looking for a minivan alternative! Ride with style and have plenty of space! What really sold me on my vehicle was the third backseat option. I am a mom, and a Girl Scout leader so having the extra seating space was important to me. You can put the seats down if you need more trunk space. I also like how well my SUV drives. The pickup speed is great and the drive is smooth. Great control of the vehicle. Lots of space. Very roomy and comfy! The interior is stylish and the front console is updated with the ability to plug in your iPhone for Apple play. It instantly gives me a Bluetooth effect. I can talk to Siri and have her send texts, and make phone calls without using my hands. My phone will also charge while being plugged into Apple Pay. The gas mileage is great. I usually get anywhere between 28-30 MPG.